Sacred Economics traces the history of money from ancient gift economies to modern capitalism, revealing how the money system has contributed to alienation, competition, and scarcity, destroyed community, and necessitated endless growth. Today, these trends have reached their extreme—but in the wake of their collapse, we may find great opportunity to transition to a more connected, ecological, and sustainable way of being. This book is about how the money system will have to change—and is already changing—to embody this transition. A broadly integrated synthesis of theory, policy, and practice, Sacred Economics explores avant-garde concepts of the New Economics, including negative-interest currencies, local currencies, resource-based economics, gift economies, and the restoration of the commons. 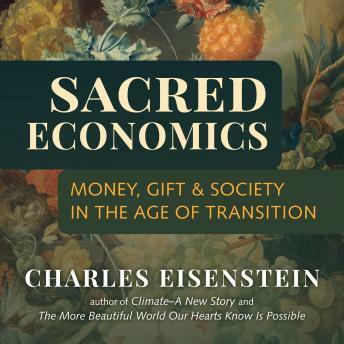 Author Charles Eisenstein also considers the personal dimensions of this transition, speaking to those concerned with 'right livelihood' and how to live according to their ideals in a world seemingly ruled by money. Tapping into a rich lineage of conventional and unconventional economic thought, Sacred Economics presents a vision that is original yet commonsense, radical yet gentle, and increasingly relevant as the crises of our civilization deepen.